Using essential oils is not a new found fad… it is something that has been used for thousands of years in most countries to help balance emotions. When Big Pharma entered into the picture, oils fell by the wayside in the United States. Young Living was and is key to reversing that trend, and you see inferior oils in many stores now. Do not be fooled by the others….. Young Living is THE world leader of Essential Oils… the oldest essential oil company in the world…. AND the only with with its own farms and Seed to Seal guarantee. Survival tools should be multifunctional, and YL oils are no exception to this rule. Every single one of them has health promoting abilities and many have powerful emotional support. Can you imagine how the spritz of fragrance from a fresh orange peel can brighten your day? Within the oil of the peel lies a constituent called Limonene. This is a naturally made chemical that works almost magically on our Limbic system as described above to promote feelings of calm and happiness. I encourage you to do some research on your own as each of the citrus oils (Lemon, Lime, Tangerine, Bergamot, Orange) do this very very well. Other oils can be very helpful with different emotions and feelings…..
StressAway: a blend of 5 oils known for their abilities to relieve daily stress and tension. This is a blend unique to Young Living, and is a personal favorite of mine. I carry it in my lab coat at work, and use it daily. Lavender: probably the most well known of essential oils, and best known to create a calming and relaxing environment. When you are preparing your bag, this is one oil you won’t want to be without due to its many functionalities. Lack of concentration and focus can be detrimental, especially when focus is of utmost importance. Oils that may help with this would include Lemon, Rosemary, Peppermint, Clarity (a powerful blend) . Grief and sorrow are both something we have to deal with on occasion. Oils that may help with this would include Bergamot, Joy (a blend), Juniper, White Angelica (a blend), and Gentle Baby (also a blend). Many of the oils mentioned above can be found in the Premium Starter Kit. 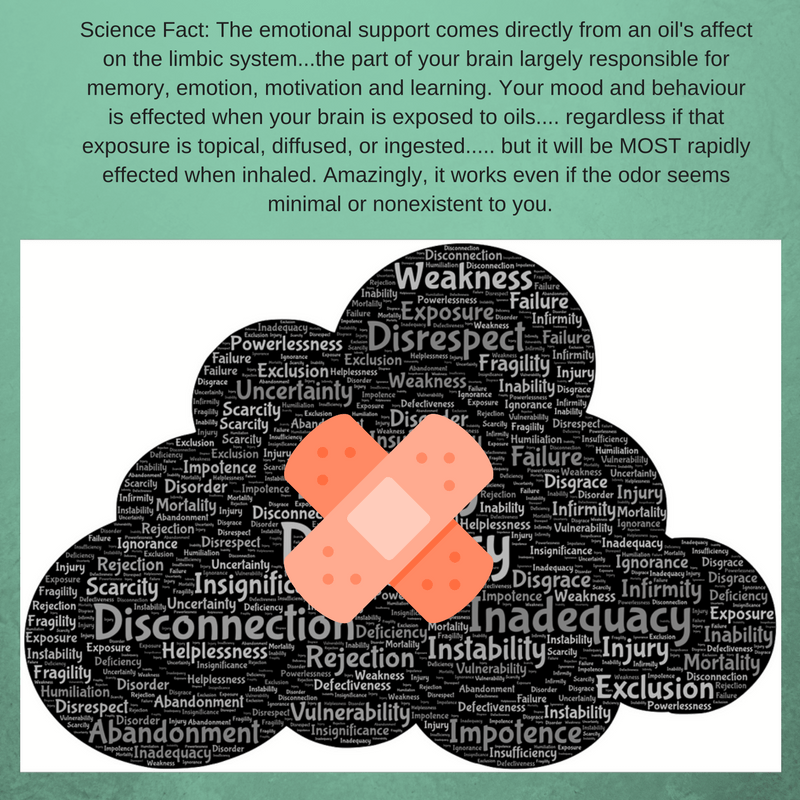 If you’d like to learn more about managing emotions with oils, I’m happy to help! There are many products and oils that Young Living has that can support emotional health in this dept :). Lavender, StressAway, Orange, Tranquil, and many others. Please remember, I am only speaking on behalf of Young Living. Not all oils are created equal. Have you had a chance to read my blog post on odor does not equal effectiveness? This will explain things a bit better.